4. Tinplate (or aluminum) sheet is carry up by three suction pads, three vacuum generators are equipped. 5. Several magnet separators are equipped for tinplate sheet while air blowing separators for aluminum sheet. 2. Max. tinplate size 1145 x 1145 mm. 3. Min. tinplate size: 600 x 600 mm. 4. Max. tinplate lifting capacity: 2000kg. 5. Feeding speed per min. : up to 40 SPM. 6. Compressed air required: 5kgs x 250l/min. 7. Sheet outlet height: 882mm. 8. Horse power required: 1hp x 1, 1/2hp x 1, 1/4hp x 1. 9. Floor space overall height: 2820 x 2120 x 1670 mm. 10. Machine net weight (approx): 1270 kg. 2. Built with driving mechanism, easy connecting with any Slitter or scroll shear. 3. Easy for maintenance and adjustment. 4. Multi-safety design to insure machine and personnel safety. 5. Roller table use drive reducer suitable for one operator serves multi feeders. 6. 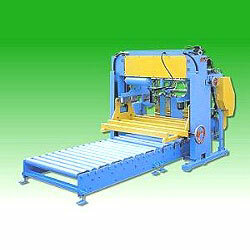 Tinplate (or aluminum) sheet is carry up by three suction pads, three vacuum generators are equipped. 7. Several magnet separators are equipped for tinplate sheet while air blowing separators for aluminum sheet.